In the last article, I talked about processing your inbox. By now, you should have a clear understanding of your inbox, and the method of processing all the items coming into it. If you find it confusing or find it difficult to process all these items, you can start by applying one fundamental question- is this item actionable? This question has just two answers- yes or no. If the answer is ‘no’, simply delete the item from your inbox. If the answer is ‘yes’, however, there are options available to you. Before we discuss these options, keep in mind that processing the inbox is meant to be short and simple (Tweet This). It should not be something you avoid doing because it is to complicated. With a simple and concise processing method, you will find yourself processing inbox items as soon as they come in. Evaluate the item and think about how long it will take you to complete it. If it will take two minutes or less, do it right away instead of saving it for later. 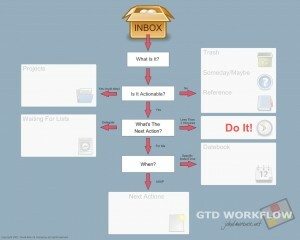 If you do it as you are processing your inbox, you can remove it from your system to keep things simple and efficient. David Allen refers to this as the two-minute rule. If you manage other people, you will be delegating tasks all the time. Think about each task and how you might delegate it to someone else. If the item can be delegated, just write a short email or make a quick phone call to delegate it. The two-minute rule still applies, so if you cannot delegate it within two minutes then defer it. If the action will take you more than two minutes to complete, defer it. Deferred actions should not be completed while you are processing your inbox, just add the item to the appropriate list and move on. For instance, developing a presentation is an action you can defer to later in the week or even next week depending on when it is due. Items can be deferred to a certain date or time, in which case you mark it in your calendar. Alternatively, they can be deferred to an unspecified time and added to your action items list. This is where a good system for managing your to-do items comes into place. Your system will help you relax and become better organized. If you capture all of your action items in one place, you will notice yourself feeling more relaxed and in the present. This is because once your brain trusts your system to manage ALL of the incompletes in your life, it will not have to, and it can relax and focus on the present. In simple terms, you will not be able to focus on your present tasks, like writing a report, going to dinner with friends, or just watching a movie without being distracted by the things that you have captured with your system. Your brain will not let you relax until ALL of your incompletes are captured in a system that it trusts completely! What type of system do you use to manage all of the incompletes in your life? Comment here. If you would like to learn more about getting things done and how it can help you to your live your life on purpose subscribe to our mailing list or visit our ProductivityTools page to read all of the articles in this series.